Exclusive to Ergoresearch, our sensor pad device was developed and manufactured in Montreal. Thanks to high-deformation sensors, it produces a highly precise podo-barometric assessment. Each patient’s foot pressure is recorded at load and at half-load, the data is then transmitted to the firm’s computational servers and a top quality orthotic device is created featuring optimal performance. Ambient humidity: 5 % to 90 %. The sensor array only requires a USB connection to work. Launched in 2011 by Ergoresearch, the WebFit® system includes a podo-barometric sensor pad (pressure range), an optical scanner and clinical software. It is the first bimodal system to produce a full podometric assessment. 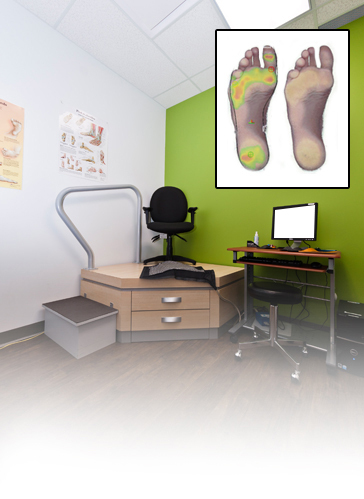 It ingenuously combines imaging and foot pressure points to offer the optimal assessment and foot imprints. These imprints are recorded at full and partial load using high-deformation sensors that are exclusive to Ergoresearch. Clinical software then creates a complete medical report on foot condition, arch type, gait and anthropometry while integrating efficient photo-documentation and foot imprint analyses. Entire system can be integrated into a folding mobile podium – ideal for satellite clinics.